by Lorenzo G. Flores Ph. D.
Learn how to manage the forces that shape your career The X Factor In Career Advancement The Perfect Myth: The Conventional Wisdom Models The Real World Model: Find A Way To Get Pre-selected The Multi cultural Promotion Track Simulation Game Achieving A Break Through: How To Effectively Use This Book Changing the Career Advancement Paradigm. The new paradigm states that there is no substitute for hard work and working the politics of the organization. Without dialogue about career politics organizations will never realize the degree to which politics drains morale and undermines productivity. If you are not career savvy, you can bet your competitors will be. 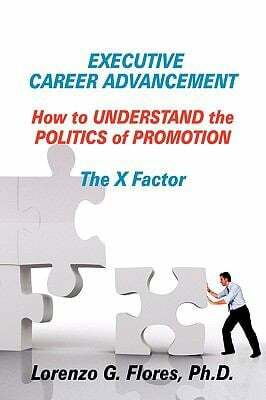 The book promotes the development of better career decision making skills through an understanding of promotion politics. The book fills a void - not fully addressed by Executive Leadership Programs, Management Training and Career Counseling Curriculums. Career Advancement is a discipline with principles that can be taught and mastered. The secret to Career Advancement is cutting time off the learning curve. The book features a frame work that can help x-ray the organization's promotion practices. Your success is only as good as your ability to analyze and work with the organization's politics. The Art of Promotion Politics. The book engages the reader at a deeper level of thinking by presenting new concepts, compelling quotes and incisive career shaping questions. The Book Is Must Reading Anyone interested in career advancement or safeguarding their position in today's competitive organizations will benefit from the text. This cutting edge book, contains insights that higher-ups tend to share only with people in their inner circle of friends. It will help organizations maintain a fair and level career playing field.